A unique skeltris-like game. Pieces drop down like skeltris, and they consist of arrows pointing in one of four directions. Use the arrow pieces to make an "Encircle" and it clears all the blocks that are enclosed. Special blocks include piece-destroying, rotation, and blank pieces that have no arrows. These can help or hurt you. The last private release was December 22, 2002 and was made available October 7, 2007. Encircle the pieces if you can! 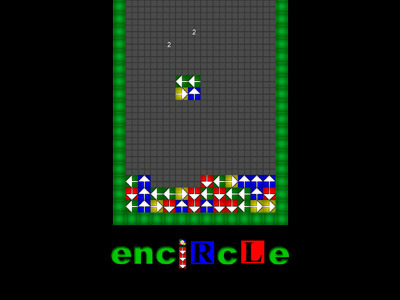 Give Encircle a try. It's free, and available on the download page. You can get it here.